A Nome (from Greek: Νομός, “district”) was a administrative part of ancient Egypt. Nome is a Greek name, used late in Egypt's history; the Egyptian name was "sepat". The division of ancient Egypt into nomes happened before 3100 BC. These nomes began as autonomous city-states, but later began to join together. According to ancient tradition, the ruler Menes finally joined all the nomes into a single kingdom. The nomes remain in place for more than 3,000 years. Lower Egypt, from the Old Kingdom capital Memphis to the Mediterranean Sea, had 20 nomes. 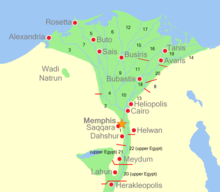 The first was based around Memphis, Saqqara, and Giza, in the area occupied by modern-day Cairo. The nomes were numbered in a more or less orderly fashion south to north through the Nile delta. The numbering started in the west, and continued with the higher numbers in the east. Alexandria was in the Third Nome; Bubastis was in the Eighteenth. This page was last changed on 26 October 2018, at 02:18.